Musical Aria soared to the top of the popularity charts in recent years. Thanks to Jen for suggesting our Baby Name of the Day. In Italian, aria means air, but not exactly the air that we breathe. Think of air in the musical sense – a melody. It’s a piece of music typically – though not exclusively – included in an opera. That takes this name towards the high arts, a different vibe compared to, say, Banjo or Drummer. 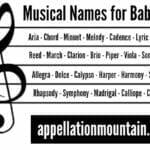 Parents love a good musical word name these days, so it’s no surprise to hear it in use. But does the name pre-date our 21st century noun name craze? Ari, of course, appears as a name element, too. It means lion in Hebrew, and eagle in Old Norse. The goddess Athena sometimes answered to the epithet Areia, as in Ares – ruin. After all, we think of Athena as all brains, but she also served as a warrior goddess, a master strategist leading troops to battle. It sounds something like Ariadne, another name from Greek myth. There’s also a saint by the name, a slave and Christian convert in second century Rome. After she refused to worship the pagan gods of her masters, she fled – and it’s said that the earth swallowed her whole. While Ariadne is seldom heard today, Ariana – one ‘n’ and two – ranks in the US Top 100. 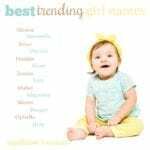 As early as 1900, five newborn girls received the name. Back in 1980, there were 33 babies named Aria. While rare, all of these historical references suggest that the name isn’t brand new. In 1996, the year George RR Martin’s first Game of Thrones novel debuted, there were eleven girls named Arya. 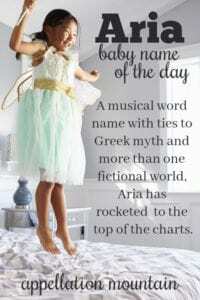 Sure, it’s just a re-spelling of Aria. But Martin’s character made it a little more. His Arya starts out a tomboyish member of the House of Stark, played to perfection by young Maisie Williams on the HBO adaptation. Martin has referenced keeping baby name books around for inspiration. I’ve seen Arya listed as a Persian name meaning noble – it’s the root of the word Aryan, as well as the place name Iran. It’s used primarily as a boy’s name in the Middle East. The Stark sister grows from headstrong to ruthless – and that makes her a leader in the world of Westeros. Then there’s Lucy Hale’s character on Pretty Little Liars, the lovely and well-traveled Aria Montgomery. Based on a successful novel series, the television show ran from 2010 to 2017. Game of Thrones debuted in 2011, so the name’s rise fits neatly with both series’ runs. Set in fictional Rosewood, the ABC Family drama follows a group of friends after one of them has disappeared – but may not be gone for good. The mystery drew in viewers, and the show eventually delivered a happy ending – at least for Aria. Two powerhouse television series, an on-trend sound, and an appealing meaning all made this name a fast favorite. 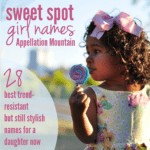 Long after we’ve left behind the fictional worlds of Rosewood and Westeros, I suspect this will still be a go-to name for a girl, a musical choice that speaks to parents after something modern, but with roots. What do you think of Aria? Would you consider it for a daughter? Originally published on September 23, 2014, this post was revised substantially and re-posted on January 9, 2019. I’m aware of 3 little Arias already–it’s a lovely name but for me, it seems to be on a fast track to super popularity. For that reason, I probably wouldn’t use it. But I’m glad it’s getting so much attention! I’m an opera singer, so no, I would never use it! It’s a pretty name, but it seems cliche for me to extend the association of my work and my husband’s work to our hypothetical child.